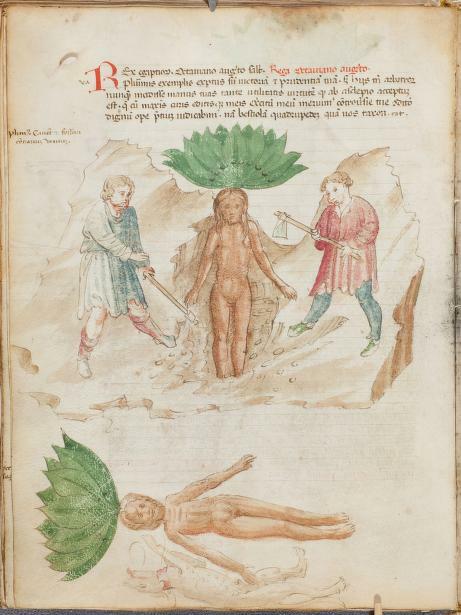 The Cushing/Whitney Medical Library is pleased to announce that our medieval and Renaissance manuscript collection is now online! The effort to digitize the manuscripts and make them freely available worldwide was generously funded by the Arcadia Fund. The manuscripts contain early medical and scientific knowledge on a variety of topics, including surgery, gynecology, medicine, herbs and remedies, anatomy, healthful living, astronomy, and mathematics. They are handwritten in Latin, Italian, Greek, German, and English. Some are illustrated, like MS18, De herbis masculinis et feminis [and other botanical and zoological works, including the Herbarium of Apuleius]. 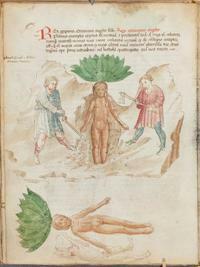 Turning the pages of this manuscripts reveals numerous hand-colored drawings of plants and animals, including the mandrake root. The mandrake root was valued for a variety of medical uses, including as an aid for reproduction. Mandrake root, as depicted in Harry Potter and in legend, would let out an ear piercing, killer scream when uprooted. Other manuscripts are filled to the very edges of the paper with text, including marginalia and commentary, like MS11, which has 24 different texts including Aristotelian treatises. Please explore these manuscripts on Cushing/Whitney Library site on Internet Archive, as part of the Medical Heritage Library. You can also find other Arcadia-funded digitized texts, including Yale Medical School theses and early Arabic and Persian books and manuscripts, in this collection. The Library plans to make the medieval and Renaissance manuscripts available through Findit, Yale University Library’s Digital Collections site.